We finally tried it, and boy are we excited for the possibilities that lie ahead. Yes, sweet potato toasts are a thing, and they are high on our list of favorite breakfast, or snack, options these days. A refreshing taste on the regular toasts, this method uses thinly sliced sweet potato as your vehicle and are more satisfying than any bread could be. I’m not going to lie, I was skeptical at first. In fact, the most common cooking method uses a toaster (yes, you heard me right) and toasts the slices as you would a regular piece of bread. We opted instead to bake in the oven, partially because I doubted the validity of using the regular toaster, which I later debunked, but also because I wanted the coconut oil flavor cooked into the sweet potato. Boy was that a good decision if you have the time. If you use the regular toaster method (toasting the slices until they are cooked through but still firm-about two rounds), you cannot use oil because you may start a fire in your kitchen. This method is great when you are pressed on time and want a quick breakfast without having to wait for the oven to preheat. 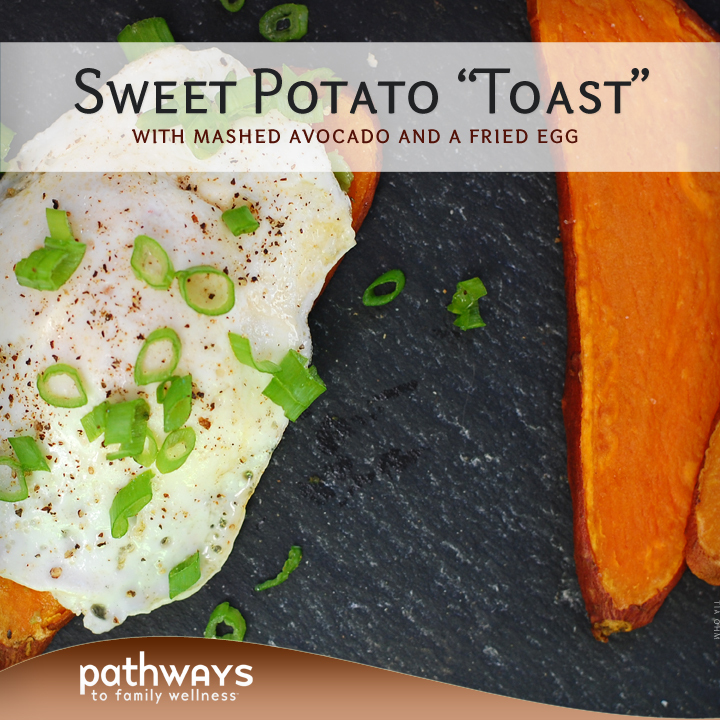 When toasting on a pan in your toaster oven or regular oven, painting each slice of sweet potato with oil is acceptable, and even preferable in our minds. 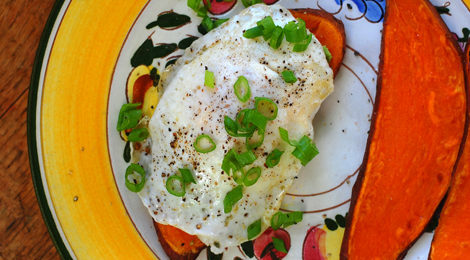 The coconut oil is a fantastic flavor enhancer and fatty addition that pairs nicely with the starchy sweet potato. After removing from the oven, we topped with mashed avocado, a fried egg, and some sliced up green onion. I couldn’t believe how tasty this combination was. After finishing the first piece, perhaps a bit too quickly, I proceeded to top the second and third slices with the rest of the avocado I had. I then ate one slice plain because coconut oil, salt, and sweet potato together is delightful in and of itself. After debating for not very long on whether or not I should have another, I decided to finish the last slice topped with almond butter, cinnamon, and coconut flakes. Dessert for breakfast anyone? Let’s put it this way: one sweet potato may only feed one person, so bare that in mind and make more if you’re serving others. Still drooling over this more-than-satisfying breakfast, I am beyond excited to try this again and again with all different toppings and cooking methods. I am thankful to whoever came up with this, because it is to say the least, absolutely brilliant, and my new favorite breakfast option. Slice sweet potato and brush both sides with coconut oil and sprinkle with salt. You don’t have to use coconut oil here. But it speeds up the cooking and adds a delicious flavor. Bake in preheated oven for about 10 minutes or until slightly soft. Do not over cook or else you won’t be able to pick it up! Alternatively you can just toast in a toaster until it is cooked through but still firm. About two rounds of toasting for us did the trick. Do not use oil if toasting in toaster! Top with mashed avocado, fried egg, sliced green onion, sea salt and freshly, cracked black pepper. Use extra avocado for the rest of the slices, or get creative and top with some nut butters or other favorite toppings.